Are you ready to submit your manuscript? Please review the submission guidelines and then refer to this checklist to ensure that you have gathered all the relevant information and that the manuscript is properly formatted. All manuscripts must be submitted using the online submission and tracking system at http://www.editorialmanager.com/molecularresearch/. If you are sure your work satisfies the basic requirements for publication in GMR, we will be happy to consider your paper. Successful receipt and processing of the author’s submission will be acknowledged by e-mail once the submitted manuscript has been checked. If no reply has been received within one week, the author should contact the editor at [[email protected]]. Articles are reviewed anonymously by independent peer reviewers. Authors are encouraged to suggest names of expert reviewers, but selection remains the prerogative of the editors. To facilitate the review process, the authors can send supplementary material, such as accepted but not yet published papers that have been cited, which may be important during assessment of the manuscript. The Journal adopts double peer review process to ensure quality and uses Editorial tracking system for manuscript submission, review and tracking its status. Review process is performed by the editorial board members of Genetics & Molecular Research or outside experts. Two independent reviewers approval followed by editor's approval is required for acceptance of any citable manuscript. To provide open access, GMR’s model offsets expenses—including peer review management, journal production, and online hosting and archiving—by applying an article processing charge for each article published, to be paid by the authors, institutions, or funders. 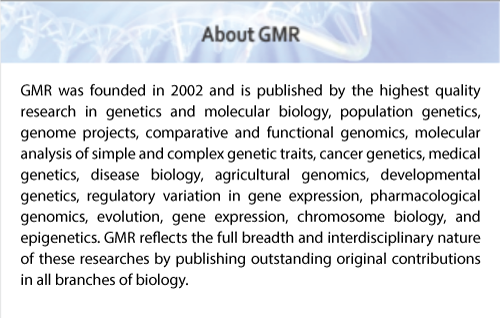 The article processing fee applied by GMR consists of a submission fee plus a publication fee. Read more about submission fee and publication fee. All authors are aware and approving of submission of the manuscript, the manuscript’s content, the authorship, and the order of authorship. You have confirmed that everyone named in the Acknowledgments section agrees to be so named. The title page includes the title of the article, authors’ names (names and initials (only) thinking in indexing services), and author affiliations. Affiliations include the author’s department, institution (usually a university or company), city, and state or nation. The title page includes the name, complete mailing address, and e-mail address of the author designated to review proofs. A running title of no more than 60 characters (including spaces) is provided. A full title (no more than 150 characters) and a running title (no more than 60 characters) are provided. An Abstract of no more than 300 words is included. All appropriate datasets, images, and information are deposited in the relevant repositories, and undeposited data are submitted as supplementary material files. Standard nomenclature is used throughout the manuscript file. Non-standard abbreviations are defined upon their first use in the text. All figures and tables are called out in the manuscript in ascending numeric order, upon first appearance. Original figure files are uploaded using high resolution (300-600 dpi) .tiff format. If any of your figures is under copyright, you have notified the journal office. You have used MathType for display and inline equations, as it will provide the most reliable outcome; or Equation Editor if using MathType is not possible. GMR style is used for references. We recommend that you upload all your files in one step by creating a single .zip file, which will be automatically unpacked by the submission system. Need help? [[email protected]] if you have any questions.